STURGIS – Two competitions will combine, but only one ultimate winner will emerge. The Sturgis Buffalo Chip, Hot Bike Magazine, Adventure Power® and Kinetik® Pro Audio converge to roll out one big, bad bike show on the largest stage of motorcycling. The Sturgis Buffalo Chip has upped the stakes and possible notoriety for custom bike builders in its online-to-onside Top Builder Competition by announcing that finalists from the competition’s Kinetik Pro Audio and Adventure Power Classes will be part of Hot Bike Magazine’s Sailor Jerry Winner Takes All Competition. 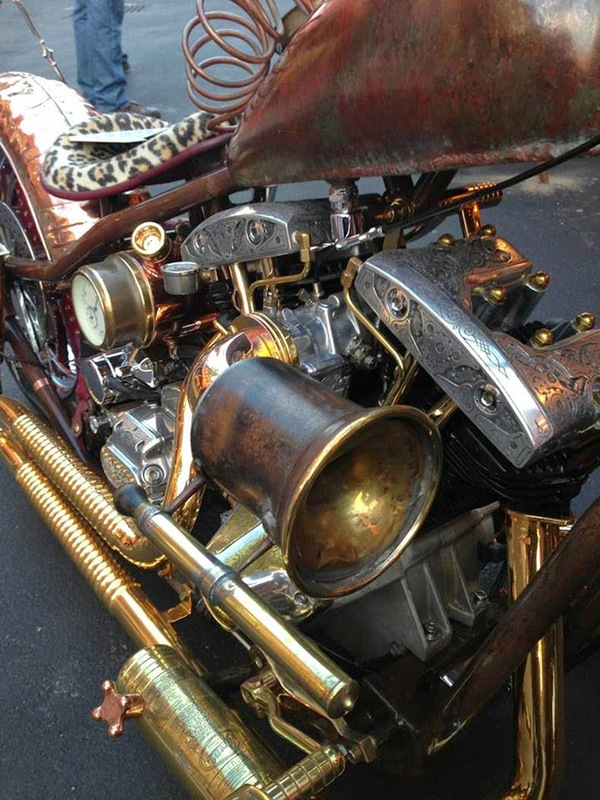 The final competition takes place at the Buffalo Chip on Aug. 5, giving competitors a shot at a $5,000 cash prize, a host of other prizes and the pride of knowing their bike beat out the loudest, most-creative and best-built collection of custom bikes in all of Sturgis. Power Class. Entries may be submitted on the Legendary Buffalo Chip Facebook page or on partner sites, APBatteries.com and KinetikAudio.com. Kinetik, makers of top quality power cells used by professional car audio enthusiasts, sponsors the Kinetik Pro Audio Class. This class is an audiophile’s dream come true, with bikes loaded to the hilt with the latest in high tech audio. Competitors who want to win must make sure their systems’ can hit all the high notes and drop bone-rattling bass, all while producing crisp, clean sound. With the superior quality and performance delivered by Adventure Power’s Powersports Series Batteries, it only makes sense the company would sponsor a competition featuring the best in custom motorcycle craftsmanship. The Adventure Power Class is one where anything goes and bling is often king, from complete one-off frames to shimmering hand-cut and jeweled cylinder fins. This class will feature both industry icons and emerging builders showcasing exceptional designs and creativity through innovation and radical styling. Builders and fans can vote online for their favorite bikes through July 14. After that, a combination of fan and motorcycle industry veteran votes will narrow down the entrants to eight from each class who will then compete at the Buffalo Chip CrossRoads on Tuesday, Aug. 5. Each category’s winner will take home cash prizes, trophies and industry perks. The Top Builder grand prize winner will also earn the opportunity to serve as face of the 2015 Top Builder marketing campaign. The 16 bikes from the Top Builder Competition will also compete against the elite builders in the Hot Bike Sailor Jerry Winner Takes All Competition to vie for prizes including $5,000 cash. The Hot Bike Winner Takes All Bike Show is open to all builders and will be judged by an expert panel of custom motorcycle junkies. The show runs from 1-3 p.m. and a $40 entry fee is due upon registration. Universal Power Group, Inc. is a leading supplier of batteries and power accessories, and a provider of supply chain and other value-added services. UPG's product offerings include proprietary brands of industrial and consumer batteries of all chemistries, chargers, jump-starters, 12-volt accessories, and solar and security products. UPG's supply chain services include procurement, warehousing, inventory management, distribution, fulfillment and value-added services such as sourcing, battery pack assembly and battery recycling. For more information, please visit the UPG website at www.upgi.com. The Adventure Power brand is UPG’s complete line of batteries for motorcycles, scooters, ATV's, personal watercrafts, snowmobiles, and American V-Twins. These batteries are designed, engineered and tested in accordance with JASA's JIS D 5302, the internationally accepted standard for power sports batteries, to meet the needs of the demanding lifestyle of the power sports enthusiasts. Adventure Power batteries are compatible with virtually every model of power sport vehicle available. The lineup includes modern, high-performance lithium ion options for today’s high-powered vehicles, to more conventional lead acid batteries for early model, vintage machines. For more information, please visit www.apbatteries.com. Kinetik, a trusted UPG brand, brings power to the masses in the 12-volt electronics industry. Through its lifestyle cult following, Kinetik has become one of the move revered car audio brands on the market today! Kinetik power cells are known for being used in the “World’s Loudest Vehicle”, by top competitors and enthusiasts as they provide the power to reach more than 183 decibels and beyond. Kinetik’s new HC PRO, REV and BLU series provide expanded options to consumers powering quality aftermarket electronics. Car and powersports audio/video, hydraulics, lighting kits, performance parts and many more 12 and 16 volt aftermarket electronics can perform better and last longer with clean filtered power on demand by Kinetik. For more information, please visit the Kinetik website at www.kinetikpower.com.